The destructive force of a train is tremendous, since most of them weigh between 125–250 tons. Even a big rig can’t withstand the power of a locomotive rolling down the tracks, and collisions between trucks and trains frequently cause catastrophic injuries. Failure to avoid crossings. Commercial truck drivers can’t always avoid railroad tracks, but they should do so whenever possible. 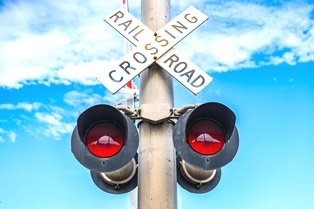 When crossing is necessary, operators should stop between 15 and 50 feet from the tracks. Failure to observe warning signs. Truckers should always be on the lookout for the typical X-shaped railroad warning sign, which must be treated as a yield sign. Drivers should also observe any warning lights or descending crossing gates in order to avoid crossing in front of an oncoming train. Distracted driving. When approaching a railroad crossing, truckers must turn off the vehicle’s climate control system and radio, roll down the window, and listen for a train. In addition, truck drivers should always look both left and right a couple of times prior to proceeding in order to avoid pulling out in front of a train. Shifting gears. Truckers should only cross railroad tracks while in the lowest possible gear, and they should never shift gears at a railway grade. Doing so can cause the engine to stall, and prevent the truck from crossing in time to avoid an oncoming train. When a truck driver’s negligence causes a collision with a train, other vehicles are often in the path of the resulting carnage. If you were injured due to a truck’s collision with a train, you deserve compensation for medical bills, loss of income, and pain and suffering. Because of the complexities of cases like these, it's important to have a legal partner you can trust to see the process through to a rightful conclusion. To learn more, contact the law offices of Steve M. Lee, P.C., by clicking the Live Chat button on this page.